Talking before the Northern Trust this week, Tiger Woods has made an early call as to who he thinks will be crownded the PGA Tour Player Of The Year. His pick? 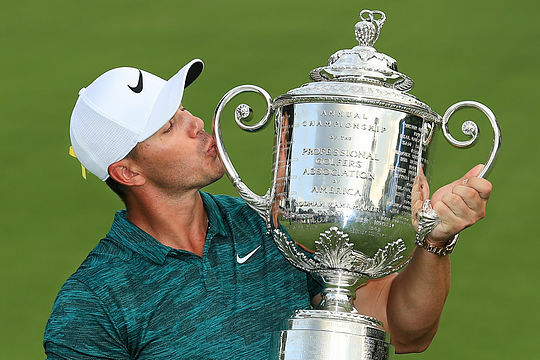 Brooks Koepka, who recently held off Woods in St Louis to win his second major of the year at the PGA Championship. Woods, a record 11-time winner of the PGA Tour Player of the Year Award, said it was a pretty simple decision. “You win two majors, you’ve got it. It’s not real complicated,” said Woods. Woods was on the receiving end of just that scenario when he won four times in the 2008 season including the famous duel with Rooco Mediate at the US Open before bowing out with an injury for the rest of that season. Padraig Harrington then took out the final two majors of the year and was subsequently voted Player of the Year. However, Koepka, who lines up this week in third place on the FedEx Cup ladder, isn’t so sure. “I think the majors…obviously there’s a lot of weight with those,” said Koepka. The Northern Trust kicks off tonight and marks the first of the four tournaments in the FedExCup Playoffs Series.